A captivating rhythm draws me to five young boys drumming on plastic, overturned buckets on the bustling streets of downtown Chicago. I am on my daily commute to school. In one hour, I travel from a tree-shaded suburban town to this rhythmic center of noise and motion. Moments that mirror my life often come alive on my commutes. For example, the drummers resemble the five siblings in the family I worked with during my first service trip to the Appalachian Mountains the summer before my sophomore year. I decide to drop money in the youngest drummers' container and I see a joy spread across the boy's face, reminding me of children I met on that trip. School for me does not start in the classroom. My lessons begin the minute I leave my house. My commute now shapes my identity in ways I never imagined when I decided to attend high school in the heart of Chicago. It starts with a 15-minute ride with dad to the Metra Station, followed by a 20-minute train ride to the heart of the city. On the train, I witness an architectural transition as buildings become higher and closer together, complimenting the fast pace enveloping everyone. I arrive downtown and my commute continues. I now walk the morning rush with Chicagoans of all races and classes as I head to the CTA bus stop a couple of minutes away. The world becomes larger, then smaller with this walk. By the time I reach the bus stop, I find classmates coming from different places for the final 15-minute bus ride. On one ride, I smell liquor on the breath of a man sitting a few rows away. He is lanky with scruffy facial hair, wearing a green army jacket, and holding a brown paper bag. It is the week after Christmas break. 'Tis the season to join classmates and complain about homework loads. I describe my long paper on the role of children in the Civil Rights Movement when the smell of the man's breath comes closer. He then begins scolding all the kids on the bus saying: "Ya'll kids shouldn't be complaining about homework. I didn't do none of my homework when I was your age and look at me now. Do that homework. Stay in school. Graduate. Make something of yourselves." By then, I was a seasoned commuter. If this happened before high school, I would have felt uncomfortable in my seat and searched for another one towards the front of the bus. Instead, I nodded at the man's helpful advice. Some scenes of my commute are as entertaining as a movie, yet my imagination must write the script. I was waiting at the bus stop one morning when I saw a businessman in a full suit and tie riding by on his scooter. Maybe he was a creative entrepreneur, or just a man trying to save money rather than taking a cab. I could only imagine a day in his life. I never imagined how adaptable my commute would make me. On one cold January morning, the bus broke down. The driver said another bus would arrive in an hour. My classmates and I decided to walk so we would not be late for school. A brisk wind hit our faces as it became harder to see, and the cold made our noses drip and turned our faces red. Too bad the man with the brown paper bag could not see our walk through deep snow in single-digit temperature weather. It showed the kind of academic commitment that might warm his heart. My commute has strengthened my independence and adjustment to new situations. I now go downtown not only for school, but for other events as well. Thanks to my commute, I have branched beyond a suburban bubble and become more aware of myself as part of a larger community. 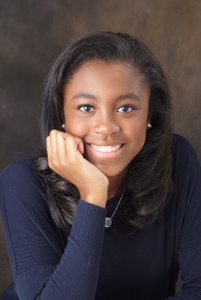 Jordan Harris, a freshman at Northwestern University, is a 2014 graduate of Saint Ignatius College Prep.